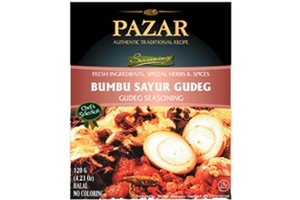 Pazar Gudeg Seasoning (Bumbu Sayur Gudeg) in 4.23oz (120g) pack. Gudeg is a traditional Indonesian disc from Yogyakarta, which is made from young Nangka (jack fruit) boiled for several hours with palm sugar, and coconut milk. Pazar authentic traditional Indonesian recipe made with fresh ingredients, special herbs & spices. Product of Indonesia. Gudeg (green jackfruit stew) is a very sweet dish made of young jackfruit, cooked with palm sugar and seasoning until it turns dark brown and cannot be distinguished from cassava leaves, which are boiled together with it, and from the red beans, which are optional ingredients.